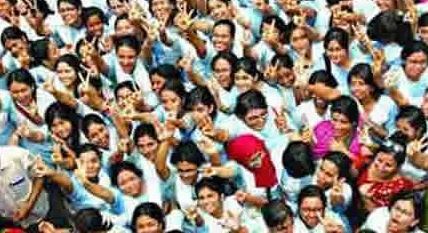 Combined Results for all education boards is 77.77%, SSC Result for 2018: SSC 79.40%, Madrasha 70.89%, Vocational: 71.96%. Total GPA-5: 1,10,629, Total students were 20,26,570 in this year. Last year combined result was 80.35%. SSC Result 2018 published on May 6, 2018 for all education boards. SSC Results 2018 published on May 6, 2018 at 1:00pm for all education boards in Bangladesh. Education Minister of Bangladesh Nurul Islam Nahid handed over the result to Prime Minister Sheikh Hasina in the morning, At 1:00pm, results for ssc 2018 be available at education boards websites, mobile sms and at the educational institutes. How to get SSC result for 2018 ? Results are available in the institution, school or College noticeboard. Get Examination SSC Results ! – For Dhaka educationboardresults visit Dhaka Education Board Result website: www.dhakaeducationboard.gov.bd. – For Comilla education board result visit Comilla Board Result website : www.comillaboard.gov.bd. – Rajshahi Board Result website : www.rajshahieducationboard.gov.bd. – Chittagong Education Board Result website: www.bise-ctg.gov.bd. – Sylhet Board SSC Result link : www.sylhetboard.gov.bd . – Dinajpur Education Board SSC Result website web : www.dinajpureducationboard.gov.bd . 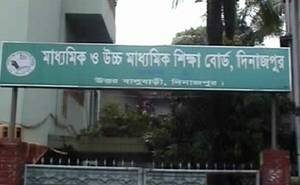 – Jessore Board Result website : www.jessoreboard.gov.bd . – Barisal Education Board Result website : www.barisalboard.gov.bd . – Bangladesh Madrasah Education Board Result: www.bmeb.gov.bd . – Bangladesh Technical Education Board (BTEB) Result : www.bteb.gov.bd . We listed here all education board Bangladesh websites to get result and other information. 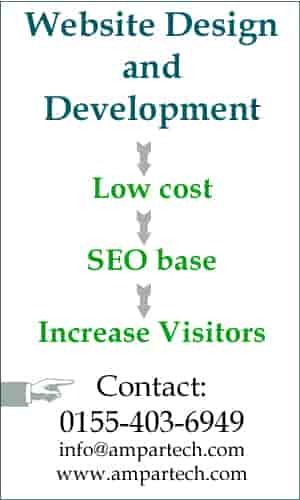 You can copy or type above link to Mozilla , internet explorer or other browser to visit website. How to find out result from website? Go to message option of mobile set for GrameenPhone (GP), Banglalink, Airtel, Robi, teletalk. SSC or Dakhil <space> First 3 letters education Board <space> Roll no <space>2017 Then send to 16222 . SSC DHA 584684 2018 (for SSC result). The mobile operator will send a SMS with the result. If you think your result or marks is lower than your expectation. Or failed one or two subjects. Then a decision to rescrutiny the subjects. In this process the authority will take initiatives to re-check your papers. The education boards do not allow many days to apply for this process. So you should apply as early as possible. Rescruitiny is sms base with a charge of Tk. 150 per subject and you can send SMS through TeleTalk sim yourself. – Sylhet Board Result . – Dinajpur Education Board HSC Result . – Barisal Education Board Result . 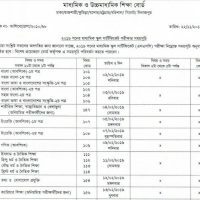 – Bangladesh Madrasah Education Board Result . – Bangladesh Technical Education Board (BTEB) Result . – Diploma in Business Studies (DIBS) Result . In the mark sheet you will not see subject marks but GPA, such as 2 to 5 and Grade : A+, A, A-, B, C, D, F.
The Board of Intermediate & Secondary Education, Dinajpur started in 2006. It is an autonomous and self-regulating institution in the field of educational administration & management in Bangladesh. Dinajpur Education Board is responsible for the supervision, control & development of Intermediate, Secondary and Junior level public examinations and educational institutions of districts i.e Dinajpur, Rangpur, Gaibandha, Kurigram, Lalmonirhat , Nilphamari, Thakurgaon and Panchagor. Dinajpur Education Board result archives for SSC. SSC 2016 results for Dhaka education board and other boards. SSC result 2016 published on May 11, 2016 for all Education Boards. All boards Passed 88.29%, Total 109,761 score GPA 5 in SSC and Equivalent. Total Examinees were 1651523. The SSC results 2016 published on the day for all boards – Dhaka, Comilla, Rajshahi, Chittagong, Sylhet, Dinajpur, Jessore, Barisal, Madrasha and Technical Boards at the same time. On February 1, 2016, the SSC and equivalant examinations started and the written exams were ended on March 8. 2016, except practical. A total of 1651,523 students participated in the examinations in 2016 under 10 education boards of Bangladesh. The consequences of the current year’s Secondary School Certificate ( SSC ) and its restuls will be distributed on May 30, 2015. 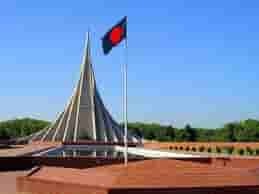 A duplicate of the outcomes will be given to Prime Minister Sheikh Hasina at the Prime Minister’s Office at 10:00am on that day. After a press preparation at the ministry, the outcomes will be authoritatively declared at 1:00pm by Education Minister Nurul Islam Nahid on the same day ( May 30 2015 ). The SSC and proportionate exams started on February 6 2015 rather than February 2 because of the countrywide uncertain barricade by the opposition parties in Bangladesh. An aggregate of 14,79,266 students took the exams under the 10 education boards. Visit www.educationboard.gov.bd or www.educationboardresults.gov.bd for your SSC results. To get SSC result from www.educationboard.gov.bd or www.educationboardresults.gov.bd you should have information like Board Name, Roll Number and you will see on the result form the examination name and year already selected by the SSC results system, then click submit button. Oh! May be you will not get SSC result immediately due to bandwidth shortage of www.educationboard.gov.bd and www.educationboardresults.gov.bd because thousands people trying to get result from the website at the same time. SSC candidates should not worry, just try again and again for the dream result of SSC from these two website www.educationboard.gov.bd and www.educationboardresults.gov.bd. You can also visit education boards particular website as given above of this page. The authorities of the two website www.educationboard.gov.bd and www.educationboardresults.gov.bd as well as www.dhakaeducationboard.gov.bd should increase bandwidth to give highest number of visitors access at a time. If students cannot get result immediately after the result out then why these websites. We hope Education Ministry of Bangladesh will take proper action to transfer these two website www.educationboard.gov.bd and www.educationboardresults.gov.bd to dedicated server with unlimited bandwidth. 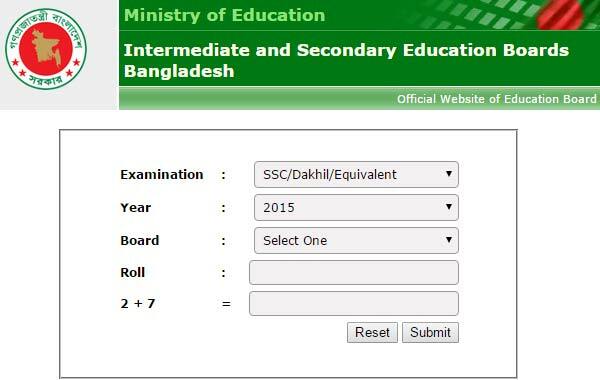 visit www.educationboard.gov.bd site to get ssc or hsc result for 2015 in Bangladesh from your mobile, recheck the sms sending procedure from mediabangladesh.net hsc result page. If you are a relative of a scc /hsc result 2015 seeker, you should have candidate roll number and board name which will be needed to find out ssc or hsc result 2015.